Glucosamine is a naturally occurring compound which plays a role in the maintenance of cartilage and connective tissue in the joints. 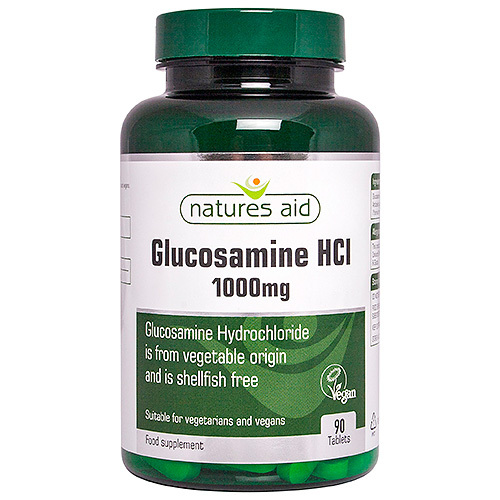 Natures Aid Glucosamine HCl provides a non-shellfish, non-animal form of Glucosamine. This makes it the ideal choice for vegetarians, vegans and those allergic to shellfish. (*derived from the fungus Aspergillus niger). Below are reviews of Natures Aid Glucosamine HCl - 90 x 1000mg Tablets by bodykind customers. If you have tried this product we'd love to hear what you think so please leave a review. 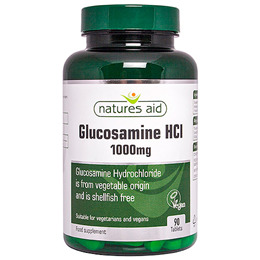 Natures Aid Glucosamine HCl provides a non-shellfish, non-animal form of Glucosamine. Glucosamine is a naturally occurring compound which plays a role in the maintenance of cartilage and connective tissue in the joints.